Ever since the Second Temple's destruction, a prayer for the construction of a Third Temple has been a formal and mandatory part of the thrice-daily Jewish prayer services. 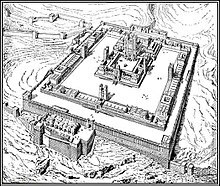 However, the question of whether and when to construct the Third Temple is disputed both within the Jewish community and without; groups within Judaism argue both for and against construction of a new Temple, while the expansion of Abrahamic religion since the 1st century CE has made the issue contentious within Christian and Islamic thought as well. Furthermore, the complicated political status of Jerusalem makes reconstruction difficult, while Al-Aqsa Mosque and the Dome of the Rock have been constructed at the traditional physical location of the Temple.